Fellow craft campers, steel yourselves. In a burst of Dammit! I AM a finisher! the quilt top destined to marinate in its juices for veritable epochs (i.e. 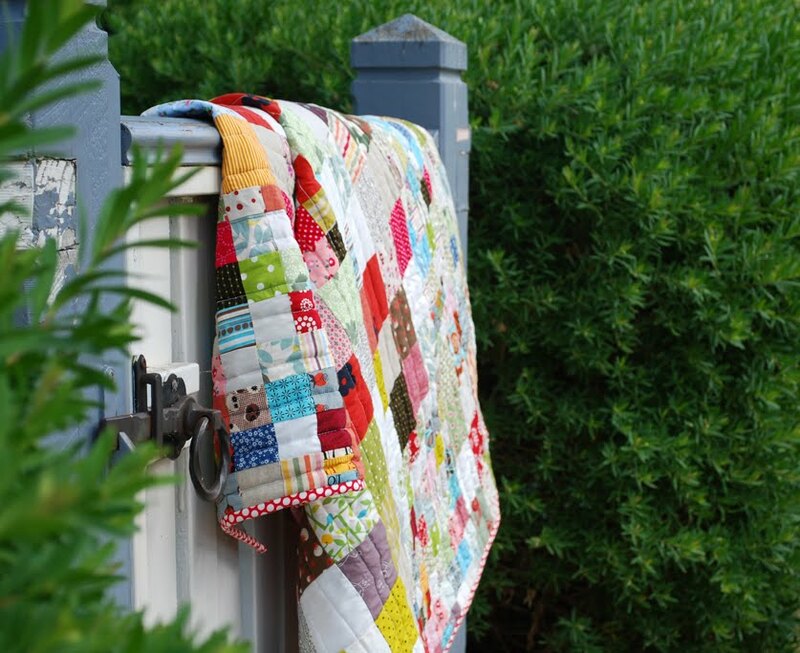 ages longer than five months), is basted, quilted and completed with a smug, handstitched binding. There are 560 little and littler squares of the very scrappiest scraps. I love scraps. Scraps have history. After I’d finished the quilt top at Camp, I gathered up most of the scrappy quilt top scraps and made a scrappy cushion cover. There are scrappy cushion cover scraps, waiting in the wings and, a bit weirdly, I sense a scrappy potholder in my destiny. 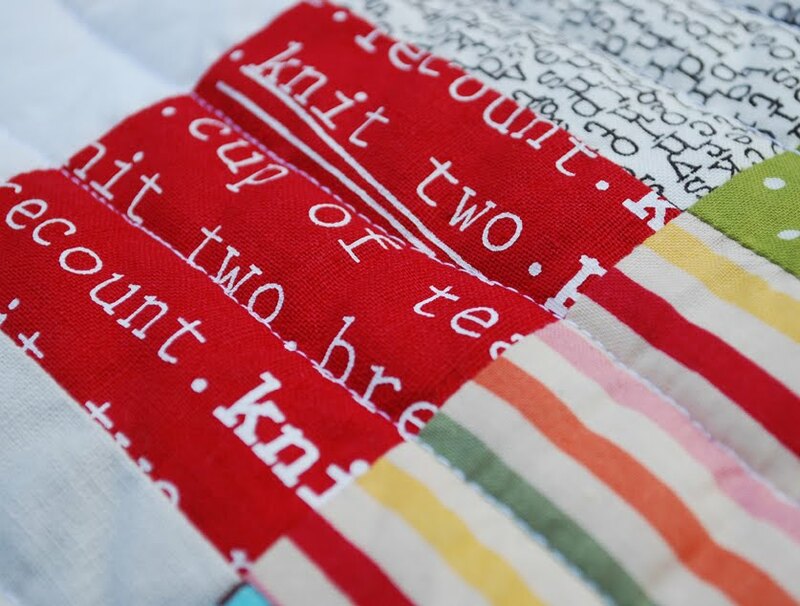 (Just thinking about scrappy potholder scraps is scary). 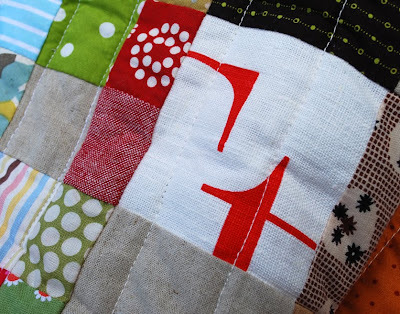 I keep throwing the scrappy quilt in an artful, spontaneously considered fashion, over the arm of the sofa. Tragically, no one else seems to appreciate the spontaneously artfully considered. Every time I turn around, the scrappy quilt has been unceremoniously pegged to the Other Thing Which Did Take Six Epochs to Finish and morphed into another kid cubby house. Hi! Your quilt is fantastic! 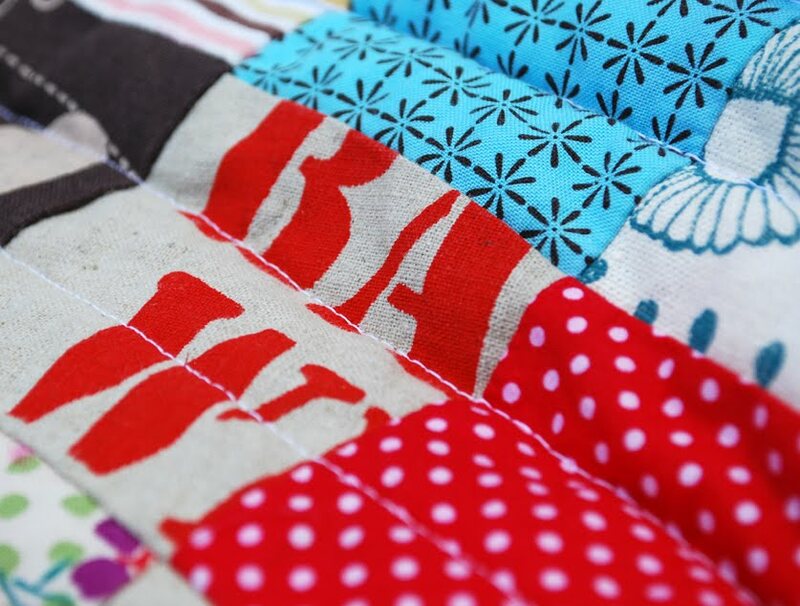 I love scraps and colourfull quilts! Loving the cubby house version too. It's stunning. Scraps at their best!. I am constantly picking my handspun blanket off the floor and folding it beautifully on the daybed. Well done. You finished. Finishing is great. Ohmigawd! That is bloody beautiful! Top notch finishing, lady! Ooh, it's so lovely. Love the spotty binding! oh T, so lovely. Well finished you. Love the artful throwing of the quilt! The quilt turned out amazingly good! Well done you! It's magnificent!! 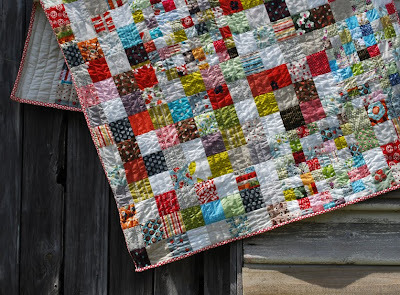 Gorgeous, gorgeous work and I love the history of the scraps.. That's an heirloom that is! 'Tis gorgeous, and I love that there are so many stories in there. 'Tis a thing of beauty. No wonder the kids keep stealing it! That history, those stories, that's why i love a quilt, oh, and the beauty. My word you are a finisher and a damn fine one at that , love that scrappy quilt ! It's wonderful. It's splendid. It defies a sufficiency of superlatives. don't know what you win, but you surely have to win something! I think as long as you don't make key-fobs from the pot-holder scraps and then go looking for ideas for something to make from the key fob scraps, you're ok. But of course, all I care about is DID YOU USE THE WALKING FOOT ON THAT QUILT? Done good, played hard, kicked scraps! 560 little squares, you freak , of gorgeousness. Tania it's gorgeous!!! How did you manage to make all those scraps look like you spent forever picking out coordinating fabric at a quilt shop? I just love it. Well done. Oh my, what a beauty! I am duly impressed and anxiously awaiting your pot holder! Wow. What a fabulous scrappy quilt. Nice work. WONDERFUL!! I'd love to wrap myself up in it :). What a fabulous quilt - you have done a great job. don't you love that sense of satisfaction you feel upon completing a project like this. One of your finest craft moments T. Just exactly 110% what a quilt should be in my humble opinion...jam packed full of memories! You do know of course that the cubby making just packs it with a different kind of memory don't you? GOLD. Congratulations, you must be very proud. love it Tania! Especially for the history involved (and the binding). You keep on artfully throwing it over the arm of that sofa!!! So lovely - so highly impressive - it almost makes me want to tackle my own scraps quilt ... but then I remembered ... it's in the dark art pile! I agree with Kirsty - making memories with a made of memories quilt is all kinds of cool! I love it! I can't imagine how much sewing was involved in though! I am inspired! I've been pondering a scrappy quilt using all those bits of 'far too small to do much with but too precious to dump' bits and yours looks just stunning! 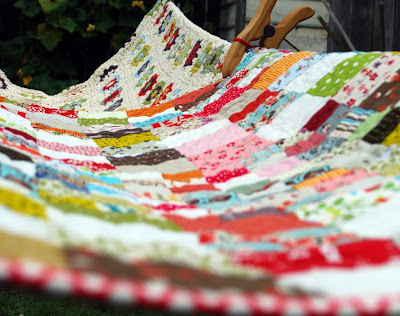 How many quilts have you made before you tackled this one? Just came across your lovely blog! Beautiful quilt! 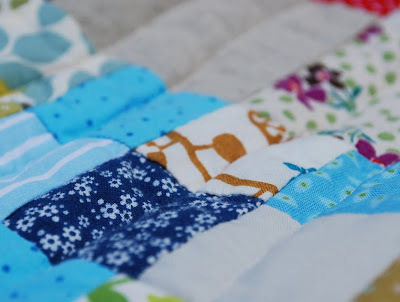 Scrappy quilts are best, especially as cubbies. From scraps to gorgeous. Lovely!! It's nice to know I'm not the only one that can take a long time for completing a project. i take it as one of the best compliments receivable to have the kids play with something i made. of their magic little hands and eyes are drawn to it and want to play with it, i am thoroughly filled up. as i am when i see the things you make. almost every time. i have already copied the sweater pattern off of you, and now i have bookmarked this quilt, and in the back of my mind, i often think about dear fly. did you make up the pattern, just from seeing the other one, or is there a pattern you actually used for the dimensions? yay!! big congratulations on that beauty my short friend. Gorgeous quilt. 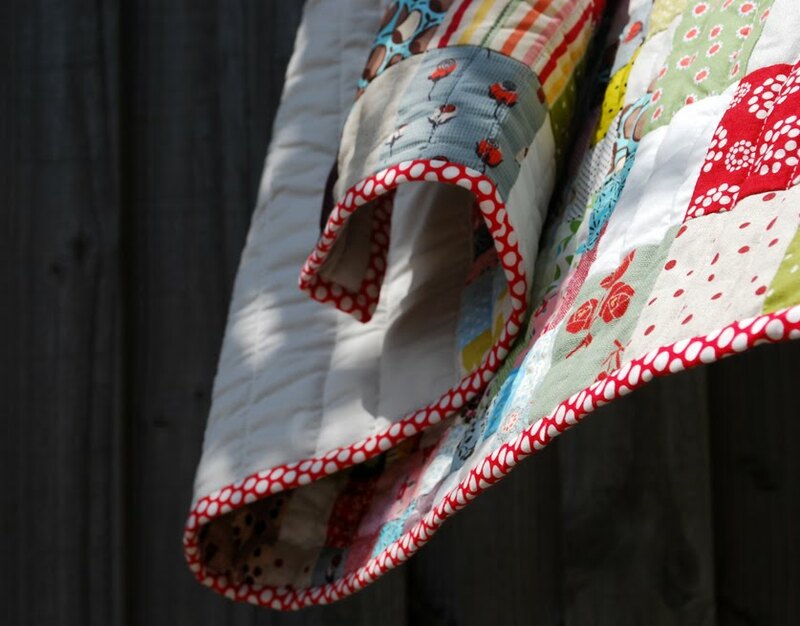 Scrappy quilts are so yummy. My son loves using my quilts for cubby houses too. The marinating did the trick. It's bloody marvellous! That's quality quilting T. You should write a book. 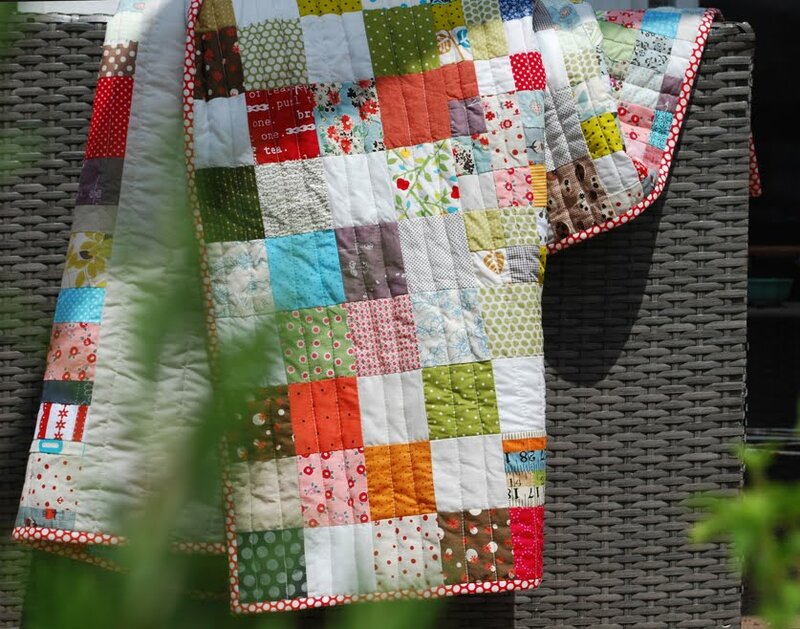 That quilt is absolutely stunning Tania - plenty of scraps here and lots of inspiration thanks to you.